Have a mentioned enough times here how much I love pies? And I mean all pies, sweet and savoury, simple or intricate, thick or delicate, with homemade or storebought dough- love them all. All day, everyday, pie is king. During the summer though, I mostly gravitate towards the sweet varieties: all these beautiful, colorful and juicy summer fruits are just a tinsy bit tastier covered in a buttery crust, don’t you think? But then again, when I think of dishes I’d say yes to in a heartbeat, what often comes to mind is this super simple, loved for ever and ever fresh greens and feta cheese pie. 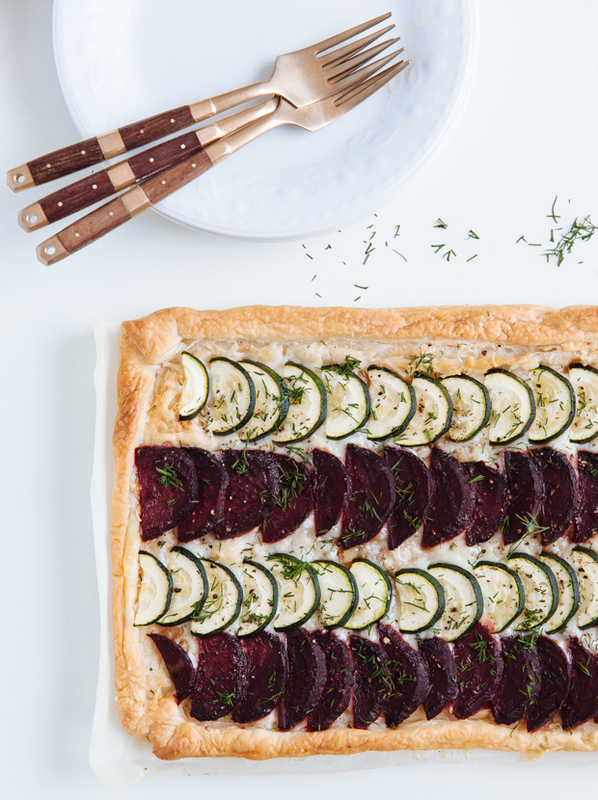 With beautiful colours and cheese in mind and my favourite extra buttery store-bought puff pastry in the fridge, I decided to make a simple savoury tart. Very few ingredients, little time, all the flavour. 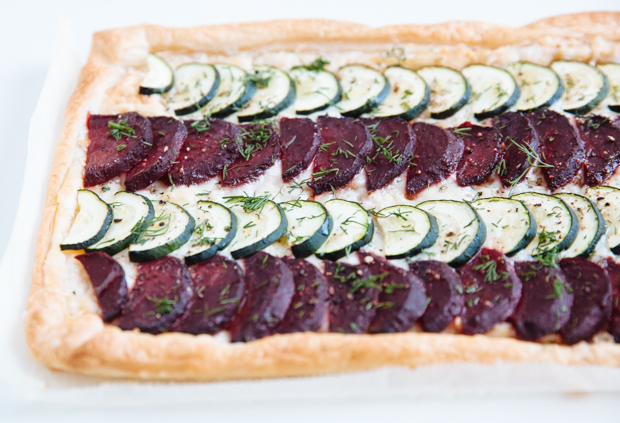 First, choose your colours: dark red, gorgeous beets- yes! And tender, sweet zucchini for some contrast- yes again! And what about that cheese? Manchego, baby! That’s how we’re doing things today; salty and a little sweet (and careful not to eat the whole damn thing before even making the pie) manchego, to balance out our sweet vegetables. 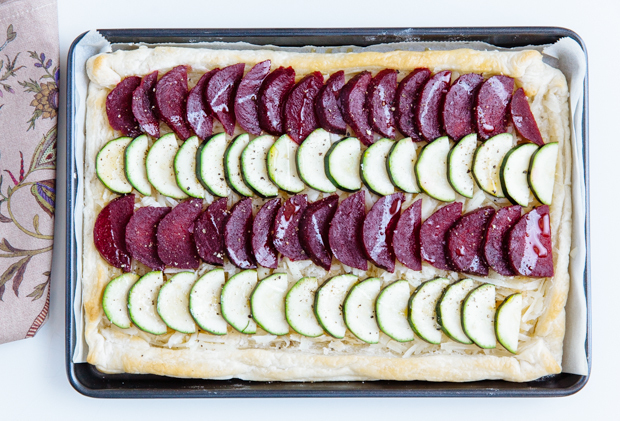 The pastry is par-baked, the vegetables are cut and the cheese is grated; almost there. Lots and lots of Manchego at the bottom of the tart- the things I’d do for melted cheese… Dark red and green half moons lined on top; olive oil, salt and pepper. 20 minutes in, a sprinkle of dill and you have pie. I mean, I don’t know if the best things in life are free, but as long as I can make pie at home, I don’t wanna know. Preheat the oven to 200C (180C for air). 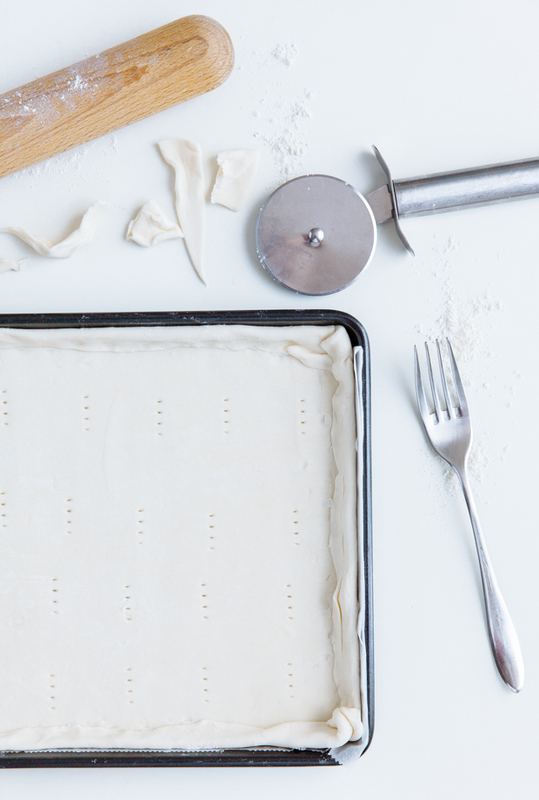 Remove the pastry from the box and, on a parchment paper, stretch with a rolling pin, so that the dough is a little longer and wider than your baking sheet. Place on the baking sheet and roll the edges inwards. Pierce the dough on several places with a fork and bake in the preheated oven until puffed and golden, about 15′. Take out of the oven, gently punch down if the dough is too puffed and cover the bottom with the grated manchego. 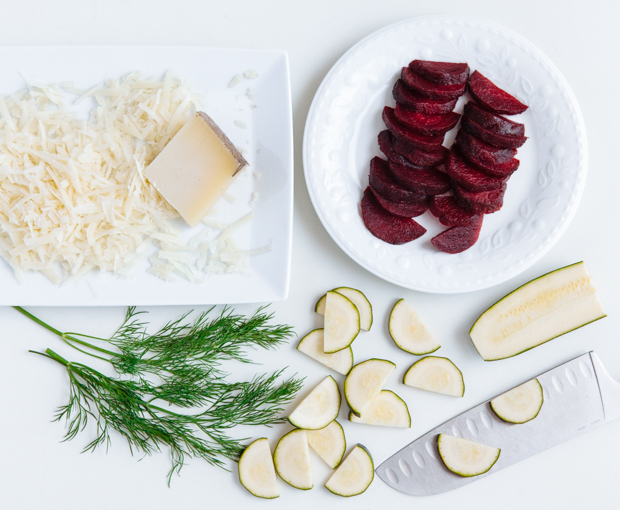 Top the cheese with the sliced vegetables; drizzle a little olive oil on top, grate some black pepper and season with sea salt flakes. 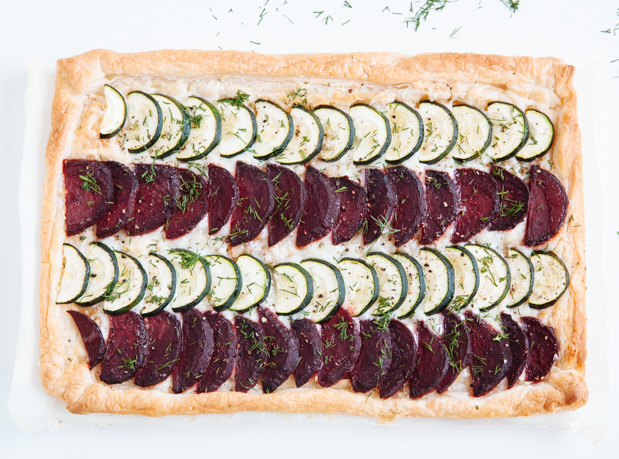 Bake for 20′, until the vegetables are tender. Take out of the oven, sprinkle with the chopped dill and serve hot.